Today Ronimo is ready to announce a new expansion for Awesomenauts, called Awesomenauts: Overdrive! The expansion will be released in Q1 2016 and includes a massive overhaul of our matchmaking system and updates to core game mechanics! In addition to these features, Awesomenauts: Overdrive will add three technologically-advanced characters to the playable roster, and brings visual improvements to various aspects of the game, including a complete visual rework of fan-favorite Sheriff Lonestar! We will introduce a completely new matchmaking system, running on our own servers, that is more stable and does a better job at pairing players of equal skill, and prioritizes connection quality. This will end up being more rewarding for our most veteran players, and be less daunting for new recruits! Whether you win or lose a match, everybody wins with this new system. The time-travelling inventor Professor M. Yoolip, hyperbike-riding bounty hunter Chucho Krokk, and the LUX5000 bot piloted by the twin babies Jimmy and Amy, are gearing up to join the Awesomenauts. These three Awesomenauts will form the premium content for the Awesomenauts: Overdrive Expansion and they will all launch together on Steam in March 2016. Each of them will receive a Beta phase that’s open for everyone, starting today with a Beta Professor M. Yoolip! Fight as a team, win as a team! The new XP and Leveling system was added to Awesomenauts in the 2.13 update. This system makes matches more dynamic, enabling both steady progression and more dramatic comebacks! The XP and Leveling system is one of the core mechanics in the game now and the first big step of many changes to come. We’ll continue to iterate on various game mechanics in the coming months. It was time for some of the ‘Nauts to join the thirty-sixth century, and Sheriff Lonestar is first in line! He has received a complete visual overhaul, and has had all of his animations and costumes redone. More content that has been with us since the launch of Awesomenauts receive visual updates over the next several months! Awesomenauts has received lots of post-launch support and content updates over the last three and a half years, this was just the start though. Now the time has come to kick things into overdrive! 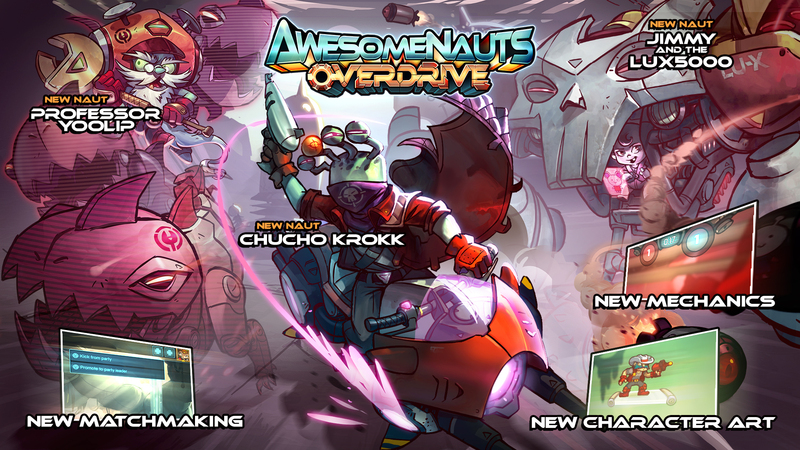 Awesomenauts: Overdrive is coming! To keep up with all the details on what’s coming, keep an eye on the new Upcoming Content page! If you want to get in on the premium Overdrive content, pre-order now and get the Clockwork Yoolip skin for free on top of the awesome three new characters! The Starstorm Station approaches! The bonus map that we’ve been developing as part of our Awesomenauts: Starstorm crowdfunding campaign is nearing completion and will be released in the coming months! Ix the Interloper, which was designed by our very own Awesomenauts community, will join the roster as a free character later on.